The history of engineering in Islam is a very wide subject indeed, and it is not easy to do it justice in a single article. The intention is to present the reader with a fair and accurate picture of the scope and significance of Muslim achievements in this field, and to indicate how Muslim engineers served the needs of society and how, in a number of instances, their work was of importance in the development of modern engineering. To realize this intention in the space available some omissions are inevitable. In the first place, and without entering into a lengthy discussion about the precise meaning of the term, ‘engineering’ is taken here as a concept that involves some degree of complexity. In civil engineering, small structures such as dwelling houses and short-span bridges have in general been disregarded. In the mechanical field military machines are not discussed and devices that require the frequent and repeated use of the human hand have been omitted. There is therefore no direct discussion of hand tools, personal weapons or textile machinery. An exception is made in the case of instruments – surveying and astronomical – because of the mathematical skills required for their construction and use. In many cases the places and dates of origin of machines or techniques have not been established with any certainty. It is not proposed to devote much space to an examination of the evidence for the origin of any particular invention, particularly if it is known that it occurred before the advent of Islam in the first/seventh century. The estimated time and location of origin will be given, with an indication of the conjectural element in this estimate and the possible alternatives, if any. It should be noted that most pre-Islamic inventions were made in the Near East that witnessed the passage of several ruling empires from ancient times till the advent of Islam. Medieval Islam was a prosperous and dynamic civilization, and much of its prosperity was due to an engineering technology that assisted in increasing the production of raw materials and finished products. In addition, the demand for scientific instruments, and the need to cater for the amusements and aesthetic pleasures of the leisured classes, was reflected in a tradition of fine technology based upon delicate mechanisms and sensitive control mechanisms. In this paper, the contribution of engineering to Islamic civilization will usually be demonstrated by specific examples, since space does not allow for a detailed survey of the interactions between technology and society. Similarly, the Islamic contribution to the development of modern engineering will be indicated by means of citing individual cases of technology transfer. There are four different types of irrigation. Basin irrigation, which was the method used in Egypt from ancient times until quite recently, consists of levelling large plots of land adjacent to a river or a canal, each plot being surrounded by dykes. When the water in the river reaches a certain level the dykes are breached, allowing the water to inundate the plots. It remains there until the fertile sediment settles, whereupon the surplus is drained back into the watercourse. Perennial irrigation is a method of watering crops regularly throughout the growing season by leading the water into small channels which form a matrix over the field. Water from the main artery – a river, major canal or qanat – is diverted into supply canals, then into smaller irrigation canals, and so on to the fields. Terrace irrigation is a method used in hilly country and consists of the formation of a series of terraces stepped down a hillside. Irrigation is by means of stored rainfall, wells, springs and occasionally qanats. Wadi irrigation depends upon sporadic rainstorms in otherwise arid lands. It consists of impounding the storm water behind dams and using this water to irrigate the fields adjacent to the watercourses. The famous dam at Ma’rib in the Yemen was the focal point of such a system. Following its original construction in the eighth century B.C.E. it was successively raised, not to impound water for long periods but to raise the wadi floods to increasingly higher levels in order to irrigate more and more land by means of a canal system which used the wadi itself as a drain. The final breakdown of the dam is thought to have occurred about a quarter-century before Muhammad’s birth. From the second century B.C.E. until the beginning of the first century C.E. the Nabateans in southern Palestine and Jordan developed a thriving agriculture based upon wadi irrigation. Whereas irrigation in the Yemen depended upon a single large dam, the Nabateans built thousands of little barriers sited across one wadi after another in order to divert or capture the one or two weeks of runoff occurring each year. There were many other irrigation systems in the Muslim world, ranging from the great canal networks of Egypt and Iraq, down to village fields watered from one or two wells. One of the largest systems was centred on the city of Marw in Khurasan on the River Murghab, which provided the irrigation water for extensive farmlands. In the fourth/tenth century the superintendent of irrigation at Marw was said to have had more power than the prefect of the city, and to have supervised a workforce of 10 000 men. Greatly surpassing this, however, was the land of Sughd (Bilad al-Sughd ) – now part of Uzbekistan. The mainstay of its fertility was the Sughd River, now called the Zarafshan, which flowed through the great cities of Samarkand and Bukhara. At the height of its prosperity in the third/ninth and fourth/tenth centuries this land was rich and fertile beyond compare, its agriculture supported by a vast network of canals extending for many miles around the two cities. Given the large numbers of men required to construct, maintain and control the large irrigation systems, it is hardly surprising that most of the enterprises were under State control, although it was not unusual for work to be let out to subcontractors. There are several Arabic treatises which tell us a good deal about the methods used for surveying and some of them discuss the excavation of new canals and methods for maintaining existing ones. We shall discuss land surveying in a separate section, but a section on quantity surveying in a treatise written in Iraq in the fifth/eleventh century is worth mentioning, since it also provides us with information about irrigation works in general. Instructions are given for calculating the quantities of earth to be excavated from canals of given lengths, widths and depths and for converting these quantities into manpower requirements. The canal banks were reinforced with bundles of reeds, and the man-hours required for preparing and placing the bundles are given. For excavation, the number of diggers (called ‘spades’) was first calculated, and to these were added the numbers of carriers to each spade, which depended on the distance the spoil had to be carried. Overheads for ancillary workers and supervision were then added. There was a set price for each task, so in the end a Bill of Quantities was produced which would provide the estimate for the cost of the works and serve as a guide for the recruitment of labour. Or, if the project was let out to subcontract, the Bill of Quantities would be the main document for awarding the contract and for the subsequent measurements and payments. Quantity surveying methods have not therefore changed materially over the centuries. From this treatise, and elsewhere, we get a picture of a highly organized State enterprise, with an army of bureaucrats, engineers and surveyors, controlling a very large labour force, whose productivity and rates of pay were closely specified. One of the most effective methods for providing water in regions without perennial streams is the qanat, an almost horizontal underground conduit that conducts water from an aquifer to the place where it is needed. The technique probably originated in northern Iran in the eighth century B.C.E. It was in widespread use in the Muslim world in the medieval period and up to modern times. Indeed, recent estimates have shown that 75 per cent of all water used in Iran at the present time comes from qanats and that their total length exceeds 100 000 miles. The city of Teheran alone has thirty-six qanats, all originating in the foothills of the Alburz 8 to 16 miles away, with a measured flow of 6.6 million gallons a day in spring and never below 3.3 million in the autumn. Outside Iran, qanats are still in use in parts of the Arab world, notably in the south-east of the Arabian Peninsula and in North Africa. The qanat system was used by the Umayyad and the Abbasid caliphs. The Caliph Al-Mutawakkil (847-866) constructed a qanat system for the supply of water to his new palace at Samarra. Recent excavations there showed that the water was obtained from ground water of the upper Tigris and conveyed to Samarra in qanat conduits totaling 300 miles in length. The construction of qanats is in the hands of experts (muqanni) and the secrets of the profession are largely handed down by word of mouth from father to son. The termination of the qanat, either farmland to be irrigated or a community to be provided with potable water, or both, will be known in advance, as will the general location of likely aquifers. One of the main skills of the muqanni lies in determining, by examining the alluvial fans for traces of seepage and hardly noticeable changes in vegetation, precisely where the trial well is to be dug. When the excavators reach the impermeable layer the well is left for a few days while the muqanni estimates the potential yield of the well by hoisting up measured quantities of water and at the same time observing any fall in the water level. If necessary, further wells are sunk to ensure that genuine groundwater has been reached; the shaft with the highest yield is chosen as the ‘mother well’. The next step is for the surveyor – or senior muqanni – to determine the route, gradient and precise outlet of the qanat. The route will be selected according to considerations of terrain and, in some cases, questions of ownership. To start the survey, a long rope is let down into the mother well until it touches the surface of the water, and a mark is made on it at ground level. The surveyor then selects a spot on the route 30 to 50 yards from the mother well for the first ventilation shaft. A staff is held on this spot by a labourer, and the surveyor measures the fall with a level. Nowadays a modern surveying level may be used but in earlier times one of the instruments described in the section below on surveying was used. A second mark is made on the rope coinciding with the measurement on the staff; the distance from this mark to the lower end of the rope will be the depth of the first ventilation shaft. He continues to level in this way along the route, marking the rope at the location of each shaft, until he reaches the end of the rope. He has then reached a point on the ground at the same level as the surface of the water in the mother well. For the mouth of the qanat he now chooses a place below this level, but higher than the fields, and divides the drop from the level point to the mouth by the number of proposed ventilation shafts and adds this amount to the previously surveyed depth of each shaft. In this way be determines the gradient of the conduit, which is usually from 1 : 1000 to 1 : 500. After completion of the survey, a number of guide shafts, about 300 yards apart, are driven under the supervision of the surveyor. Then the rope with the marked length of each vertical shaft is handed to the muqanni, who now begins to work with his assistants by driving the conduit into the alluvial fan, starting at the mouth. At first the conduit is an open channel, but it soon becomes a tunnel. Another team sinks ventilation shafts ahead of the tunnellers, and labourers haul the soil up to the surface through these shafts. Two oil lamps are kept burning on the floor of the conduit; sighting along these, the muqanni keeps the tunnel in alignment, and they also serve as a warning of poor air, since they go out before there is a danger of a man suffocating. As the work nears the mother well great care has to be taken in case the muqanni misjudges the distance and strikes the full well, in which event he might be swept away by the sudden flow. 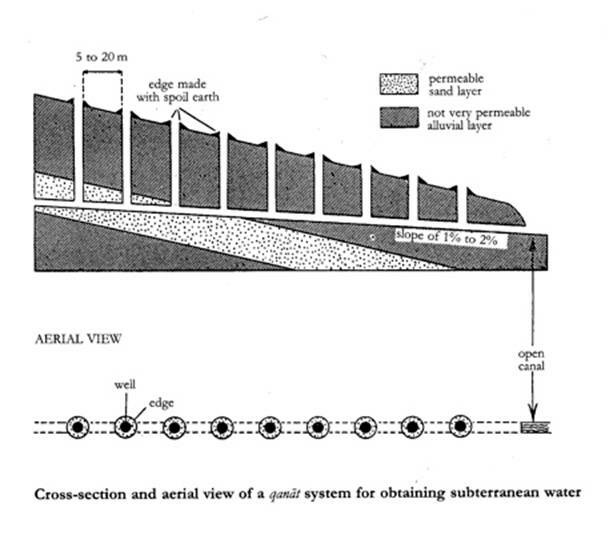 It can be seen, therefore, that the construction of qanats is a special example of the difficult and dangerous profession of mining (see Figure 1). It may be considered as one of the most successful of man’s inventions, since it has been in continuous use for over 2500 years. Dams are required in most hydraulic systems, whatever their purpose, but the functions of dams vary. In wadi irrigation, as we have seen, they are used to trap the floodwaters that result from heavy but infrequent downpours, so that the water-level is raised above that of the surrounding fields, to which it can then be conducted under gravity. For perennial irrigation dams are used to divert water from streams or rivers into the canal network. The impounding of rivers behind dams gives more control over the supply throughout the year. As with wadi irrigation, it also allows the water in the reservoir to be gravity-fed into irrigation and town supply systems. A further advantage, if the water is to be used for hydro-power, is that there is a high, fairly constant head of water, which would not be the case if the river were unregulated. There are two basic types of dam – gravity and arch. The first, as its name implies, relies upon the weight of the dam to withstand the pressure of the water. For additional strength, buttresses are sometimes added to the downstream wall. As with all hydraulic structures, good foundations are of the utmost importance, since failure can occur if the scouring action of the water undermines the foundations. Arch dams are designed to resist the force of the water and silt by horizontal arch action and are adaptable only to those sites where the length is small in comparison to the height and the sides of the valley are composed of good rock to resist the arch thrust at the haunches. With very rare exceptions true arch dams were not built before modern times. The selection of the materials of construction was influenced partly by the design of the dam and partly by availability. Earth dams were common and are still in widespread use today. They are perfectly satisfactory for certain kinds of service, provided they have a core of clay or other impermeable material and plenty of overflow capacity, but they are not really suitable for high dams. In certain areas, notably lower Iraq, earth dams were almost universal; they were (and are) quite adequate for diverting rivers into canal systems and, in any case, the cost of transporting large quantities of stone would have been prohibitive. In other areas, where higher dams were needed, some form of masonry construction was necessary. This could be of dressed stone, mortared or not, random rubble or concrete. Quite frequently, dams were constructed by building two masonry walls with a gap between them, and then filling the gap with cheaper material such as earth or rubble. If the dam was designed to discharge overflow water from its crest, this had to be of stone or concrete, since earth would quickly have been worn away by the action of the water. Roman and Sasanid dams were carefully maintained, but the demands for irrigation water and power was so great that in the more populous provinces dams became more numerous than they had been in pre-Islamic times. Many new dams were necessary as part of the extensions to the hydraulic systems in Iraq. Perhaps the most impressive of these dams, the remains of which can still be seen, was a diversion dam over the River ‘Uzaym at the point where it leaves the hills called the Jabal Harmin. The main body of the dam is a masonry wall 575 feet long which at the western end turns through a right angle and continues for 180 feet to form one bank of the canal called Nahr al-Batt. The dam has a maximum height of something over 50 feet, but this rapidly reduces towards the sides. In fact for the first 150 feet at the eastern end, the dam is only 13 feet high. The cross-section of its central portion has a neat trapezoidal profile, 10 feet thick at the crest and 50 feet thick at the base. The water face is vertical and the air face is built to a uniform slope with the masonry stepped. The dam was built of cut masonry blocks throughout, connected with lead dowels poured into grooves. This is quite a common Muslim technique and in the ‘Uzaym dam was apparently used as a complete alternative to mortared joints. The alignment of the structure is not straight, and this reflects an attempt, as usual, to utilize the natural shape of the site as advantageously as possible. ‘Adud al-Dawla closed the river between Shiraz and Istakhr by a great wall, strengthened with lead. And the water behind it rose and formed a lake. Upon it on the two sides were ten water-wheels, like those we mentioned in Khuzistan, and below each wheel was a mill, and it is today one of the wonders of Fars. Then he built a city. The water flowed through channels and irrigated 300 villages. This dam, which is some 30 feet high and 250 feet long still survives. It is made of solid masonry and does make use of a rubble masonry core. Iron bars set in lead were used to connect the blocks. Both Al-Muqaddasi and Ibn al-Balkhi agree that the stones were set in mortar, and this, in addition to binding the whole construction together, would also have served to make the dam watertight. The use of “tempered cement and sifted sand” indicates that the engineers were aware of the need for careful preparation of their mortar. Al-Balkhi writes ”even an iron tool could not scratch it” This indicates that the mortar was of excellent quality and that the dam was a very thorough and solid piece of work. It is not at all surprising that it has had such a long and useful life. There are many Muslim dams in Spain, a large number of which were built during the fourth/tenth century, the golden age of Umayyad power in the peninsula. In this period, for example, many small dams, or azuds, were built on the 150-mile-long River Turia, which flows into the Mediterranean at Valencia. (In passing it is important to note the Spanish word azud, from Arabic al-sadd, one of very many modern irrigation terms taken directly from Arabic and certain proof of Muslim influence on Spanish technology.) Eight of these dams are spread over six miles of river in Valencia, and serve the local irrigation system. Some of the canals carry water much further, particularly to the Valencian rice fields. These, of course, were established by the Muslims, and continue to be one of the most important rice-producing centres in Europe. All eight dams are similar in construction, being fairly low with vertical water faces and stepped air faces. The cores consist of rubble masonry and mortar, and the structures are faced with large masonry blocks with mortared joints. Sluices in the outflow canals permitted surplus water to drain back into the river during normal operation, and occasionally they would be opened to their full extent in order to de - silt the approaches to the canal mouth. 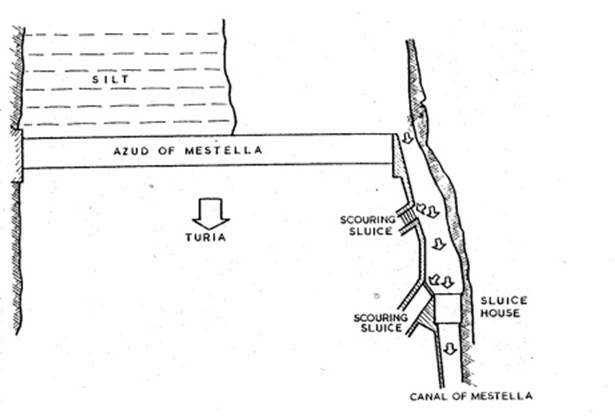 Such scouring sluices are absolutely essential to prevent the silt which collects behind a dam from choking the canal intakes and the canals themselves (see Figure 2). The foundations of these dams are massive; the masonry of the structure extends some 15 feet into the river bed and is supported on rows of wooden piles. These relatively massive foundations for low dams are accounted for by the fact that there are occasional dangerous floods in which the flow of the Turia is increased a hundredfold. The dams are then submerged to a depth of nearly 20 feet and must resist the battering of water, stones, rocks and trees. Because they are so low and flat and are provided with deep and very firm foundations, the Turia dams have been able to survive these conditions for 1000 years. Not the least of the problems facing the builders of dams is that the energy of the water spilling over the crest of a dam can, over the years, undermine the foundations on the downstream side. A satisfactory solution to this problem is demonstrated by a Muslim dam near Murcia on the River Segura. The air face of the dam had a large surface area, and this was put to good use. Water flowing over the crest initially fell vertically through a height of 13-17 feet on to a level platform, 26 feet wide, running the length of the dam. This served to dissipate the energy of the water spilling over the crest. The overflow then ran to the foot of the dam over flat or gently sloping sections of the face. In this way the whole dam acted as a spillway and the energy gained by the water in falling 25 feet was thereby dissipated, so greatly reducing the risk of undermining the downstream foundations. From this example – and many others could be cited – it is evident that the Muslims had a good empirical understanding of hydraulics. Suspension bridges with cables made of woven bamboo strips were used in China no later than the first century B.C.E. but there is no record, of its use in western Islam or Europe before the Renaissance. This does not mean that they were not used and indeed it would be strange if this simple and effective method of crossing ravines was unknown in the Zagros, the Taurus and the mountainous regions of Spain and North Africa. Similarly, we have no firm evidence for the use of cantilever bridges in Islam, apart from Afghanistan, where they had been built from, at the latest, the fifth century C.E. onwards. These are also an excellent method of crossing ravines in hilly country, but being made of timber they do not have a long life nor do they leave traces, particularly since in many cases modern bridges may have been built at their sites. Usually a timber substructure is built into a masonry abutment on either bank, and the longitudinal and transverse beams to carry the roadway extend from the top of this supporting structure. At the centre the two cantilever spans support a short beam section (see Figure 3). Large modern steel bridges, such as the Forth railway bridge in Scotland, are built on exactly the same principle. In the fourth/tenth century a bridge over the River Tab in Iran was described briefly by Ibn Hawqal. He says that the river was crossed by a wooden bridge “suspended between the sky and the water, its height above the water about 10 cubits”. He may, of course, have seen a suspension bridge, but the cantilever type seems more likely, especially since he makes no mention of ropes. There are frequent references to pontoon bridges in the works of Arabic writers. They were very common in Iraq for crossing the two rivers and the major irrigation canals. In the fourth/tenth century there were two pontoon bridges over the Tigris at Baghdad, but only one was in use; the other, having fallen into disrepair, was closed, because few people used it. Ibn Jubayr, writing towards the close of the sixth/twelfth century, described a bridge of large boats over the Euphrates at Hilla. It had chains on either side “like twisted rods” which were secured to wooden anchorages on the banks. He also mentions a similar, but larger, bridge over a canal near Baghdad. There were also pontoon bridges on the rivers of Khuzistan, the Iranian province adjoining Iraq, and on the Helmand river in Sijistan (now western Afghanistan). There seems to have been a pontoon bridge at Fustat (now Old Cairo) in Egypt for many years. In the early part of the fourth/tenth century, al-Istakhri says that one bridge crossed from the city to the island and a second bridge from the island to the far bank of the river. About two centuries later, al-Idrisi describes the same arrangement, adding that there were thirty boats in the first bridge and sixty in the second. Before the introduction of modern materials the masonry arch provided the best solution for the spanning of watercourses and other obstacles. Although they are relatively expensive to build, well-constructed arch bridges can last for centuries and they do not interfere with river traffic to the same extent as pontoon bridges or the many piers of multiple-span beam bridges. Their durability is proved by the survival of many medieval bridges, intended only for the passage of people and animals, but now sustaining the full load of modern traffic. Many Roman, Hellenistic and Sasanid arch bridges remained in use in the Muslim world, and the more impressive of these are described in the writings of the Arabic geographers. The Muslims, following the traditions of their predecessors, also built many fine arch bridges. In areas where good building stone was not available, notably in parts of Iran, the bridges were built from burnt bricks, but most of them were constructed from cut stone. The geographer al-Qazwini (d. 682/1283) has left us a graphic description of a great arch bridge at the town of Idhaj in Khuzistan; it spanned a ravine that was normally dry, but in times of flood became a turbulent lake. It was re-built by the Wazir of Rukn al-Dawla al-Hasan b. Buwayh (d. 366/977) who conscripted craftsmen from Idhaj and Isfahan. The bridge was 150 cubits (dhira’) in height and consisted of a single arch, strengthened with lead dowels and iron clamps. The slag from iron workings was used to fill the space between the arch and the roadway. Another remarkable bridge, over the River Tab in Iran, was seen by al-Istakhri in the early part of the fourth/tenth century. He says that it was built by an Iranian, physician to the Umayyad governor al-Hajjaj (d. 95/714). It was a single arch of span about eighty paces and so high that a man on a camel with a long standard in his raised hand could pass beneath it. An unusual bridge was among the works of Ibn Tulun governor of Egypt from 254/868 to 270/884. A high causeway of 6 miles was constructed from the Nile at Fustat towards the west and the bridge, consisting of forty great arches, was an extension to the causeway. The purpose of these works was to provide a passage for the army over the Nile floods if an enemy approached from the west. There were many arch bridges over canals in all the Muslim provinces where irrigation was practiced. Many fine buildings were constructed in the first Islamic century: the Dome of the Rock in Jerusalem, the Great Mosque in Damascus, the second Great Mosques in Kufa and Basra and the desert palaces of the Umayyads – to name only some of the more notable buildings. Once established, the tradition for fine architecture continued to flourish in Islam, as witnessed, for example, by al-Mansur’s Baghdad, the works of Ibn Tulun in Egypt, the Great Mosque of Cordoba and the Alhambra palace in Granada, the complex of splendid buildings in Isfahan and so on. Many well-illustrated books have been devoted to describing Islamic buildings and it is clearly beyond the scope of this chapter to attempt even a brief summary of the Muslim architectural achievement. Instead, we shall confine our attention to the most basic element in any building – the materials of construction. The Muslim geographers usually tell us which type of material was used to construct a given town or city. This could be unfired bricks (labin or tub), fired bricks (ajurr), stone (hajar) or timber. In medieval times timber was more plentiful than it is today, but even so the practice of constructing the main structures of buildings in this material was not widespread. The city of Bukhara was mostly timber-built and the houses in the town of Siraf on the Gulf were made of teak, and timber was also widely used in parts of Spain. Perhaps the most important example of timber used as a structural material is the Dome of the Rock in Jerusalem, in which the dome itself consists of two independent wooden shells, the outer one covered with lead sheets. In general, however, timber was used in conjunction with other materials where some resistance to tensile stresses was necessary, as in lintels over doors and windows, and roof rafters. The choice of material to be used in a particular building depends upon a number of factors: the availability of a material locally, cost, time and the purpose of the building. Thus it is noticeable that cut masonry was often preferred for religious buildings whereas other large buildings in the same region might be constructed from cheaper materials. Syria can be said to be the region, par excellence, for fine stonework in ashlar masonry, i.e. masonry in which each block is carefully cut to size, with straight edges and plane surfaces. This tradition has persisted in Syria to the present day; the local limestone weathers to a beautiful amber colour that is very pleasing to the eye. Ashlar work was also common in Spain (doubtless due to Syrian influence), Egypt and parts of North Africa. Sometimes money and time were saved by building the wall in random rubble and facing it with ashlar. The mortar was based upon either lime or gypsum mixed with soft sand. The use of unfired bricks was common in early Antiquity and is still widespread today. The clay which is the main constituent of the bricks is readily available in many parts of the world and houses made from this material are warm in winter and cool in summer. Moreover, its use is not confined to the building of small dwelling houses. Some of the multi-storey houses in southern Arabia are made of unfired bricks, and they can also be used in vaults and domes. They cannot, however, be used in areas with high rainfall, for heavy rains cause severe deterioration to the walls to the point of making them disintegrate. The labina generally has a geometric, fairly regular shape, that of a parallel-sided rectangle, whose variable dimensions often have the ratio 4 x 2 x 1 (e.g. length 56 cm, width 28, thickness 14, or 36 x 18 x 9) but in South Arabia 45 x 35 x 5 is usual and in Iran 20 x 20 x 4. To prepare the mixture for the bricks, the loam or clay is thoroughly soaked, mixed with straw and chaff and trodden with the bare feet. It is then carried in baskets to the moulders. Each moulder has a wooden mould, just an open frame. He covers the ground with a thin layer of chaff, puts the moulding frame flat on the ground, throws a quantity of the mud-straw mix into the mould, beats it into the corners with his bare hands, and scrapes off any surplus with a small straight-edge. He lifts the frame with a swift movement, leaving the fresh brick on the ground, and places the frame next to the brick just made. Moulding row after row in this way, he makes about 250 bricks in an hour. Unfired bricks are jointed with a mortar made with a mixture of lime or ash and are usually lined with a coating of earth mixed with lime or plaster. Burnt bricks were already made in the fourth millenium B.C.E in Babylonia and in Iran. kilns have been unearthed going back into the first millenium B.C.E. They are still in common use in many parts of the Muslim world. They are generally smaller than unfired bricks, and the preparation of the clay for them is more thorough – it has to be slaked and sieved to clean it of impurities, and additives are sometimes included, e.g. grey sand to give the bricks a whitish tinge. After moulding they are left in the open, lying fiat, for 24 hours, and then turned on edge and left to dry for another three days before being stacked in the kiln. The kiln is similar to that of the potters, and consists of a furnace with a firing room on top of it. Buildings made exclusively from burnt bricks are rare. More usually they are combined with other materials. The Qasr al-Hayr al-Gharbi in Syria, for example, built in the first Islamic century, consists of a wall of limestone, fired bricks and unfired bricks at the top. Burnt bricks were (and are) used for certain parts of buildings such as arches, vaults and staircases, and put to good use by architects to vary the decoration of their works. From the sixth/twelfth century, the glazed brick has offered the possibility of obtaining similar effects to those of mosaic. The technique of cobwork (tabya) was described in detail by Ibn Khaldun in his Muqaddima, which implies that he thought it a characteristically Muslim practice. Earth with which chalk and crushed baked earth or broken stones are often mixed is rammed between two boards kept parallel by beams. The wall is plastered over, often in such a way as to simulate joints of heavy bond-work beneath. When this plaster falls, the regularly spaced holes left by the beams become visible. In the Muslim West cobwork became general in the fifth/eleventh and sixth/twelfth centuries, especially in military building. In the Maghrib it seems to have been an importation from Andalusia, where it had long been known. In urban communities, quality control of building was exercised by an official called the muhtasib. His duties were very wide-ranging, since he was appointed by the ruler to supervise the affairs of the market, including the maintenance of moral standards and religious observance; quality and quantity control over retailers and manufacturers; sanitation and water supply; and checking the manufacture of building materials. In this last respect the hisba manuals (books written for the guidance of the muhtasib) contain a good deal of useful information. For example, the widths of walls and the dimensions of beams were checked with wooden templates, to ensure that the measurements were not less than the minimum specified. The basic requirements for public works surveying, as in the setting-out of large buildings, the excavation of canals, etc. are levelling and alignment. Whereas nowadays levelling is done with an optical instrument and a graduated staff, in earlier times two such staffs were needed in conjunction with a simple but effective instrument. Three such instruments are described in an Iraqi treatise of the fifth/eleventh century. The first of these is a wooden board about 70 cm long by 8 cm wide. In the centre of the board a line is drawn which meets both edges at a right angle. A plumb line is fixed to this line, near one of the edges. Two hooks are fixed to this edge (see Figure 4a). The second instrument consists of an equilateral triangle, with two hooks soldered to the ends of one of its sides. A narrow hole is drilled through the centre of this side, to take the cord of a plumb line (Figure 4b). To use either instrument, it was suspended to a wire or cord stretched tightly between the two graduated staffs. One end of the wire was moved up and down until the plumb line coincided with the line on the board or the corner of the triangle. The difference between the readings on the two staffs gave the level difference. The third instrument is called the ‘reed-level’. A narrow longitudinal hole is bored through a long straight reed, and a radial hole is made into this bore at the centre. The reed was held roughly horizontally by two assistants between the two staffs, which were held vertically by two other assistants. A fifth assistant then allowed water to drip into the central hole from a piece of rag. When the flow of water from each end of the reed was equal the reed was truly horizontal. As with the first two instruments, the surveyor then read and recorded the heights on the two staffs. Quite accurate levelling could be carried out over long distances by repeating the operation with any of these instruments. At the end of the survey the ‘rises’ and ‘falls’ were totalled and the difference between the totals gave the difference in level between the start and finish points. For setting out straight lines and for measuring distances ropes were used, with knots at intervals to mark the dimensions. A rotatable alidade, provided with sighting holes and mounted on a plane surface, could also be used for alignment. The astrolabe, which we shall meet in a later section as an instrument for astronomical observation and computation, was also widely used for land surveying. Here we are concerned only with the back of the instrument, which consisted of an alidade turning about a central pivot, its ends moving over a graduated circle, each quadrant of which was divided into 90 degrees. In the lower half of the face was a rectangle, one side of which was divided radially into decimals, the other side into duo-decimals (see Figure 5). 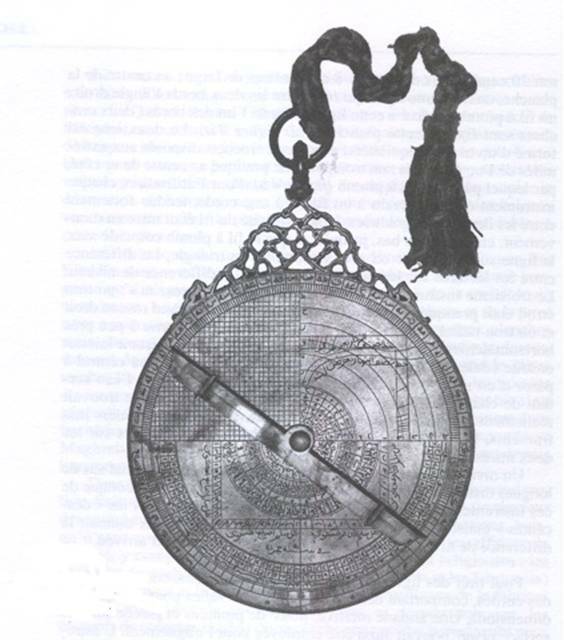 The instrument was used for alignment and measuring the angles between two points, but a number of Arabic writers also describe the solution of various triangulation problems using the astrolabe. The two matching squares into which the rectangle is divided are used for this purpose. Although the squares are divided into ten and twelve equal parts respectively, the choice of number is purely a matter of convenience. With the astrolabe freely suspended the alidade is adjusted so that a distant object is viewed through the sights simultaneously. When this happens the real right-angled triangle formed by the distance of the object and its height is reproduced on a small scale within the confines of one square on the astrolabe, by an exactly similar right-angled triangle. The real and similar triangles have a common line for hypotenuse. The ratio of the lengths of the sides of the triangle on the astrolabe is the same as the ratio of the height and distance of the object, so that if either of these is known the other may readily be calculated. If neither is known, the observer reads the angle from one station, moves back a measured distance, and again reads the angle. Since the Muslims had perfected the methods of both plane and spherical trigonometry, problems of this sort could easily be solved. For the surveyor in the field, however, it was clearly preferable to use the constructive methods provided by the astrolabe, and manuals for his use were prepared by scientists. Other problems solved by the use of the astrolabe included finding the width of a river, or the distance between two points separated by an impassable obstruction. The earliest machine used by man for irrigation and water supply is the shaduf. It is illustrated as early as 2500 B.C.E in Akkadian reliefs and about 2000 B.C.E. in Egypt. It has remained in use until the present day and its application is world-wide, so that it is one of the most successful machines ever invented. Its success is probably due to its simplicity, since it can easily be constructed by the village carpenter using local materials. For fairly low lifts it delivers substantial quantities of water. It consists of a long wooden pole suspended at a fulcrum to a wooden beam supported by columns of wood, stone or brick. At the end of the short arm of the lever is a counterweight made of stone or, in alluvial areas where stone is not available, of clay. 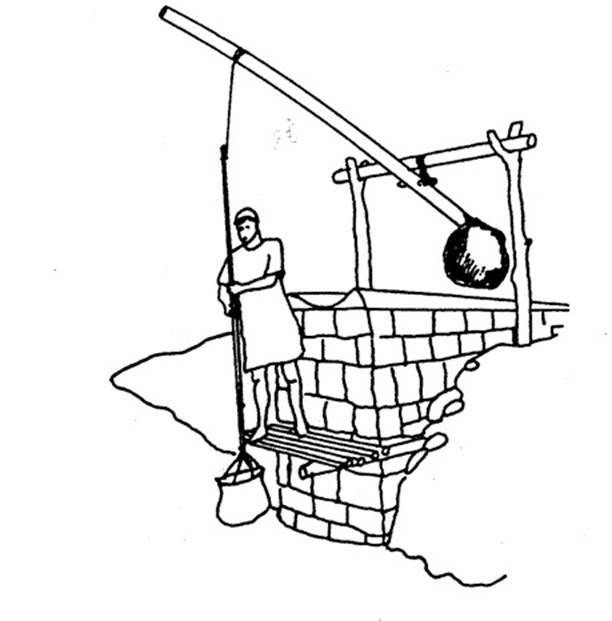 The bucket is suspended to the other end by a rope (see Figure 6). The operator lowers the bucket into the water and allows it to fill. It is then raised by the action or the counterweight and its contents are discharged into an irrigation ditch or a head tank. The scoop drum or tympanum was probably invented in Egypt in the first half of the third century B.C.E. Two large timber discs were fixed to a wooden axle which had iron pegs protruding from its ends. The pegs were housed in iron bearings supported on two columns. The space between the discs was divided into eight segments by wooden boards. The perimeter was closed by wooden boards, there being a slot in each segment to receive the water. Circular holes were cut around the axle in one face of the drum, one hole to each segment. The whole machine was coated with tar (see Figure 7). As the drum was rotated by a tread-wheel, the water was scooped from the source, entered the compartments when they were at the bottom of their travel and was discharged from them when they approached the top. The water ran into a channel and then into a head tank. The scoop drum is rarely mentioned by Muslim writers in connection with irrigation, and its main use seems to have been in de-watering mines. It is ideally suited for this purpose since it can be operated in a fairly restricted space. It was necessary to use a series of drums: the first raised the water into a tank on a platform, a second wheel raised it from this tank to a second tank and so on, until the water was discharged into a drain at the head of the mine. The screw or water-snail was probably invented by Archimedes (c. 287-212 B.C.E.) when he was living in Egypt and it is therefore appropriate that the machine is often called the ‘Archimedean screw’. 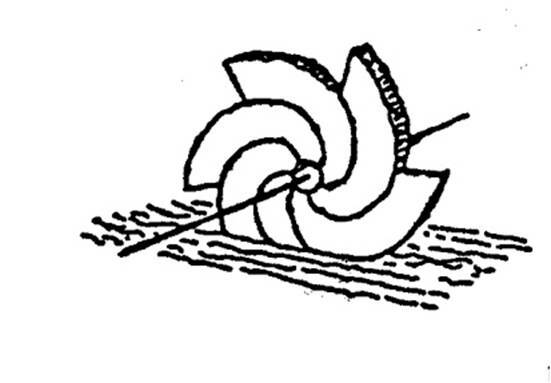 A wooden blade is fitted spirally to a long cylindrical wooden rotor. A wooden case is made to fit around the blade, constructed like a barrel, the planks painted with pitch and bound with iron hoops. The rotor is supplied with iron spigots which rotate in iron journals. The screw is set at an angle with one of its ends in the water and as it is rotated the water flows along the helix and discharges from the other end. The smaller the angle to the horizontal, the greater will be the rate of discharge. We do not know precisely how the machine was turned in earlier times – it may have been by a tread-wheel, the power transmitted through a pair of gears. Nowadays it is usually operated by a crank, but the crank is not known to have been in use before the sixth/twelfth century. The screw was in common use throughout the Muslim world until quite recently, but now seems to be becoming rarer (see Figure 8). The word saqiya is used here to denote the chain-of-pots driven through a pair of gear-wheels by one or two animals harnessed to a draw-bar and walking around a circular track. This very important machine was invented in Egypt, probably about 200 B.C.E., but did not come into widespread use until the fourth or fifth century C.E., with the introduction of the pawl mechanism and earthenware pots. Although it is fairly easy to explain the operation of the machine, it should be emphasized that its construction is quite complex, consisting as it does of over 200 separate components. Only the basic constructional details will be given here. The draw-bar to which the animal is harnessed passes through a hole in an upright shaft to which the horizontal gear -wheel is fixed by spokes. The shaft rotates in a thrust bearing at ground level and another bearing above the gear -wheel located in a cross-beam which is supported on plinths. The gear-wheel is a lantern-pinion, i.e. two large wooden discs held apart by equally spaced pegs. The vertical gear- wheel carries the chain-of-pots and is often called the potgarland wheel. It is supported centrally over the well or other source of water on a wooden axle. On one side of it are the pegs that enter the spaces between the pegs of the lantern-pinion and these pegs pass through to the other side of the wheel, where they carry the chain-of-pots. This consists of two continuous loops of rope between which the earthenware pots are attached – sometimes chains and metal containers are used (Figure 9). In order to prevent the wheel from going into reverse, the machine is provided with a pawl mechanism, which acts on the cogs of the potgarland wheel. This mechanism is essential, because the draught animal is subjected to a constant pull both when moving and when standing still. The pawl is activated in two cases – when the animal is to be unharnessed and in the event of the harness or traces breaking. Without the pawl the machine would turn backwards at great speed and, after one revolution, the drawbar would hit the animal on the head. At the same time, many of the pins of the lantern - pinion would break and the pots smash. As the animal walks in a circular path, the lantern-pinion is turned and this rotates the potgarland wheel. The pots dip into the water in continuous succession and discharge at the top of the wheel into a channel connected to a head tank. Although the main function of the saqiya is for irrigation it can also be important for water supply when, for example, buildings are some distance above the source of water. The longer the chain-of-pots, i.e. the lift, the lower the rate of discharge will be. For domestic water supply this may not be a crucial factor, but in fact one of the problems of water-raising engineering is that of raising large quantities of water through a small lift. 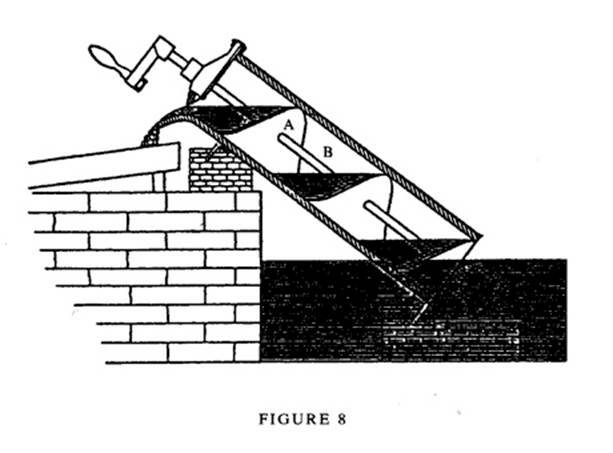 The problem can be solved by using a spiral scoop-wheel (see Figure 10), which raises water to ground level with a high degree of efficiency. This machine is very popular in Egypt nowadays, and engineers at a research station near Cairo have been trying to improve the shape of the scoop in order to achieve maximum output. Although it appears very modern in design, this is not the case, since a miniature from Baghdad dated to the sixth/twelfth century shows a spiral scoop-wheel driven by two oxen. The transmission of power is the same as that employed with the standard saqiya. The saqiya was widely used in the Muslim world from the earliest days onwards. It was introduced to the Iberian peninsula by the Muslims, where it was massively exploited. Not only was it diffused into many parts of Europe but it was also taken to the New World by Christian Spanish engineers. It has advantages over the diesel-driven pump: it can be constructed and maintained by local craftsmen and does not require the importation of fuel. The long history of the saqiya is by no means ended, and there are welcome indications that its advantages will ensure its survival for the foreseeable future. 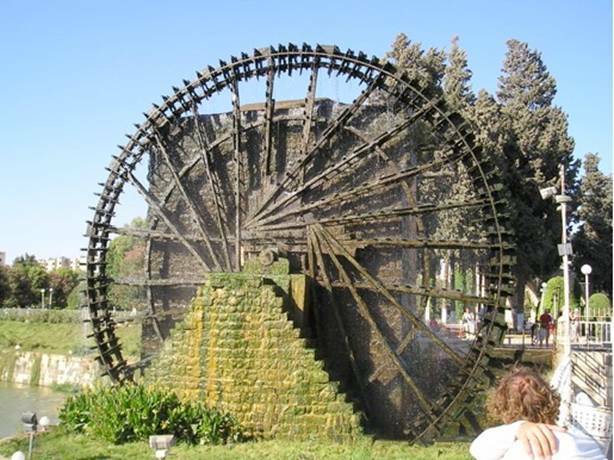 The noria is also a very significant machine in the history of engineering. It consists of a large wheel made of timber and provided with paddles. The rim of the wheel, inside the paddles, is divided into compartments or, in another type of noria, earthenware pots similar to those of the saqiya, are lashed to the rim. The wheel is mounted on an axle over a running stream, so positioned that the paddles and the compartments, at the lowest part of their travel, are immersed in the water. The force of the current acting on the paddles causes the wheel to rotate, the compartments fill with water and discharge their contents when they reach the top of the wheel. The water usually collects in a head tank and is then conducted through a feeder channel to the irrigation system or to an urban water supply (see Figure 11). Being driven by water, the noria is self-acting and requires the presence of neither man nor animal for its operation. The earliest description we have of the noria occurs in the writings of Vitruvius in the first century B.C.E., in words that imply that it had already been in use for some time. It was invented around 200 B.C.E. in the Near East. Its use was widespread in the Muslim world, wherever conditions were appropriate; there are attestations for its use in Iraq, Iran, Mesopotamia, Spain and elsewhere. The most famous norias are those at Hama, on the River Orontes in Syria. These are an impressive sight, the largest being over 20 metres in diameter; they discharge into the end of an aqueduct that carries the water to the town and the fields. These machines are known to have been in operation since the third/ninth century, but there were probably norias at this site much earlier than this. The large-scale use of norias was introduced to Spain by Syrian engineers. An installation similar to that at Hama was in operation at Toledo in the sixth/twelfth century and the machine was heavily exploited all over Muslim Spain. It was diffused to other parts of Europe and to East Asia, and like the saqiya has shown remarkable powers of survival into modern times. 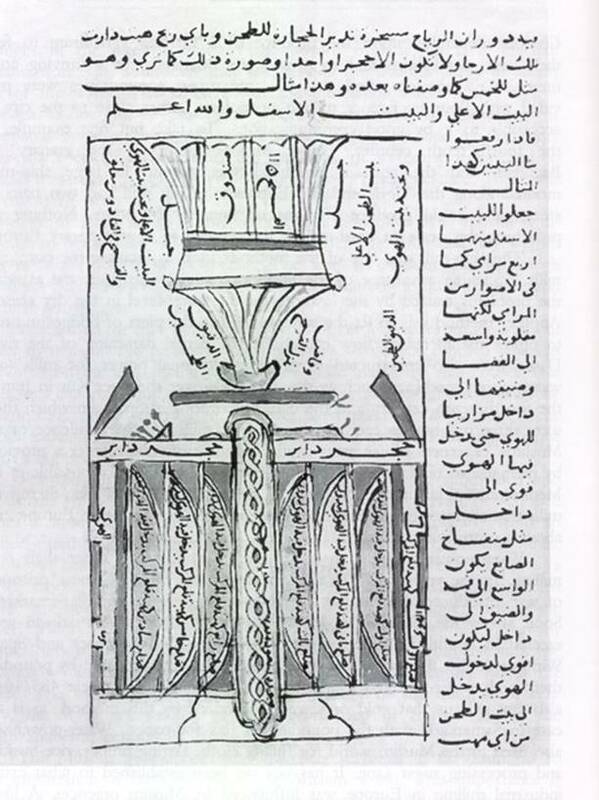 Five water-raising machines are described in al-Jazari’s great book on machines, composed in Diyar Bakr in 602/1206. One of these is a water-driven saqiya, a type of machine that is known to have been in everyday use in medieval Islam. Three of the others are modifications to the shaduf, obviously intended to raise the output of the traditional machine. These are important for the ideas they embody, ideas which are of importance in the development of mechanical engineering. In one of them, for example, the concept of minimising intermittent working is implied and another incorporates a crank, the first known example of a crank used as an integral part of a machine. The fifth machine is the most significant. This is a water-driven twin-cylinder pump (Figure 12). A paddle wheel is mounted on a horizontal axle over a running stream, with a gear-wheel mounted on the other end of the axle. This meshes with a horizontal gear-wheel installed in a large triangular wooden box which is mounted over a pond supplied from the stream. On the face of the second gear-wheel, near the outside, is a peg which enters a slot-rod pivoted at one corner of the box. The connecting rods were fixed to the sides of the slot-rod by staple-and-ring fittings. On the end of each connecting rod was a piston, consisting of two copper discs with a space of about 6 cm between them, the space filled by coiling hempen cord until the gap was filled. The cylinders, made of copper, were provided with suction and delivery pipes, all provided with non-return clack-valves. The two delivery pipes were joined together above the machine to form a single delivery pipe, which discharged the water at a height of about 14 m above the level of the stream. The action was as follows: when the paddle wheel turned it caused the gear-wheel on its axle to turn, and this rotated the gear-wheel in the box and the peg made the slot-rod oscillate from side to side. When one piston was on its delivery stroke the other was on its suction stroke. The important features embodied in this pump are the double-acting principle, the conversion of rotary into reciprocating motion, and the use of true suction pipes. The hand-driven pumps of classical and Hellenistic times had vertical cylinders which stood directly in the water which entered them through plate-valves in the bottoms of the cylinders on the suction strokes. The pumps could not, therefore, be positioned above the water level. A quarter-scale working model of this pump was made for the 1976 World of Islam Festival in the Science Museum, London. The construction is the same as that of the machine described by al-Jazari, except that the drive was electric. The pump works perfectly, with smooth transmission and the discharge of a steady stream of water from the delivery pipe. Evidence for the continuation of a tradition of mechanical engineering is provided by a book on machines written by Taqi al-Din about the year 959/1552. A number of machines are described, including a pump similar to al-Jazari’s, but the most interesting device is a six-cylinder ‘Monobloc’ pump. The cylinders are bored in line in a block of wood which stands in the water – one-way valves admit water into each cylinder on the suction stroke. The delivery pipes, each of which is also provided with a one-way clack-valve, are led out from the side of each cylinder and brought together into a single delivery outlet. On the end of each piston rod is a lead weight, and a trip lever is connected by a pin joint to the piston rod just below the weight. Cams on the axle of a water-driven scoop-wheel bear down on the trip levers in succession raising the pistons for the suction stroke. When the trip lever is released the weight forces the piston down for the delivery stroke (see Figure 13). It is worthy of note that Taqi al-Din’s book antedates the famous book on machines written by Agostino Ramelli in 1588. It is therefore quite possible that there was some Islamic influence on European machine technology even as late as the tenth/sixteenth century. There are three basic types of water-wheel, all of which had been in use for centuries before the advent of Islam and the question of their origin, and diffusion, which is still unresolved and controversial, need not concern us here. 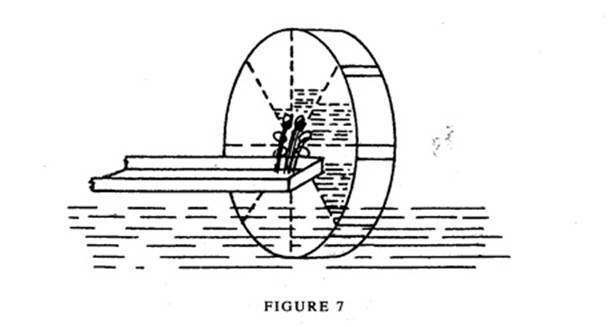 The first – the undershot wheel – is a paddle wheel mounted on a horizontal axle over a running stream (Figure 14a). Its power derives almost entirely from the velocity of the water, and it is therefore affected by seasonal changes in the rate of flow of the stream over which it is erected. Furthermore, the water level may fall, leaving the paddles partly or totally out of the water. The efficiency of the undershot wheel is not high perhaps as low as 22 per cent – because so much of the energy is dissipated by turbulence and drag. The fact that it retained its popularity over many centuries is due to the simplicity of its construction and to special measures that can be taken to increase its performance. These will be discussed later. The overshot wheel is also vertical on a horizontal axle. Its rim is divided into bucket-like compartments into which the water discharges from above, usually from an artificial channel or ‘leat’ (see Figure 14b). Its efficiency can be as high as 66 per cent, provided all the water from the leat falls into the buckets and there is no spillage. When used for corn milling, both types of vertical wheels require a pair of gears to transmit the power to the millstones. A vertical toothed wheel is mounted on the end of the water-wheel’s axle inside the mill house. This engages a lantern-pinion, whose vertical axle goes up through the floor to the milling room; it passes through the lower, fixed millstone and is fixed to the upper, rotating stone. The corn is fed into the concavity of the upper stone from a hopper (see Figure 15). The third type of wheel is horizontal, and can be subdivided into two main types. 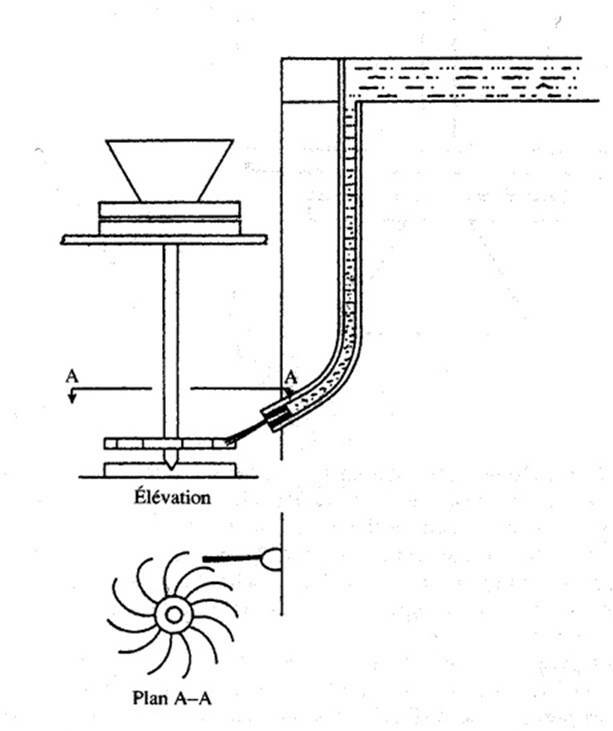 In the first of these a wheel with curved or scooped vanes is mounted at the bottom of the vertical shaft and water from an orifice fitted to the bottom of a water tower is directed on to the vanes, the flow being therefore tangential and radial (Figure 16). The second type is a vaned wheel, also fixed to the lower end of a vertical axle, and installed inside a cylinder into which the water cascades from above, turning the wheel mainly by axial flow. Axial-flow wheels can also be driven by vertical jets of water directed on to them from below. The first sub-type was known in Europe and western Asia by the sixth century C.E. at the latest. The second appears in an Arabic treatise of the third/ninth century, but is not known to have been used in Europe before the tenth/sixteenth century. The Muslim geographers and travellers leave us in no doubt as to the importance of corn-milling in the Muslim world. This importance is reflected not only in the widespread occurrence of mills, from the Iberian peninsula to Iran, but also in the very positive attitude of the writers to the potential of streams for conversion to power. The Tigris at its source, says al-Muqaddasi, would turn only one mill, and al-Istakhri looking at a fast-flowing stream in the Iranian province of Kerman, estimates that it would turn twenty mills. It is as if these travellers were rating streams at so much ‘mill-power’. This concern is understandable when we remember that the great cities of Islam such as Baghdad, Fustat and Cordoba depended upon the produce of a thriving agriculture to feed their large populations and to provide the finished materials for a thriving commerce. We therefore find that all large urban communities were provided with flour by factory milling installations, either close to the city or accessible to it by good communications. To take but one example: in the fourth/tenth century Upper Mesopotamia was the granary for Baghdad and the corn it produced was ground in large ship-mills moored on the Tigris and the Euphrates. Each mill had two pairs of stones and could produce 10 tonnes of flour in 24 hours. Nothing approaching this scale of corn-milling was known in contemporary Europe. The ship-mill was one of the methods used to increase the output of mills, taking advantage of the faster current in midstream and avoiding the problems caused by the lowering of the water level in the dry season. Another method was to fix the water-wheels to the piers of bridges in order to utilize the increased flow caused by the partial damming of the river. Dams were also constructed to provide additional power for mills (and water-raising machines) such as the dam built by ‘Adud al-Dawla over the River Kur in Iran. In the sixth/twelfth century al-Idrisi described the dam at Cordoba in Spain, in which there were three mill houses each containing four mills. Until quite recently its three mill houses still functioned, but have changed a lot from their original form. Further evidence of the Muslims’ eagerness to harness every available source of water power is provided by their use of tidal mills. This application is, of course, not possible in the Mediterranean, but in the fourth/tenth century in the Basra area there were mills that were operated by the ebb-tide. Tidal mills did not appear in Europe until about a century after this. Water power was also used in Islam for other industrial purposes.. It seems that the use of water power in industrial applications was already established at an early date. Jabir Ibn Hayyan (b.721- d.815 C.E.) in Kitab al-Sab’in (Book of the Seventy) describes in treatise XVIII a spherical vessel for melting metals. This sphere was erected on a river and it was rotated by a water wheel. The sphere rotated continuously while it was heated by fire from underneath it. Jabir describes a similar continuous rotating motion on a river in treatise XXXIV of the same book. In the year 134/751, after the battle of Atlakh or Talas, Chinese prisoners of war introduced the industry of paper-making in the city of Samarkand. The paper was made from linen, flax or hemp rags. Soon afterwards paper mills on the pattern of those in Samarkand were erected in Baghdad, the Yemen, Egypt, Syria, Iran, North Africa and Spain. Without doubt, the raw materials in these mills were prepared by pounding them with water-powered trip-hammers. Writing about the year 435/1044, al-Biruni tells us that gold ores were pulverized by this method “as is the case in Samarkand with the pounding of flax for paper”. Water power was also used in the Muslim world for fulling cloth, sawing timber and processing sugarcane. (It is interesting to note that the transfer of technology between China and Islam was a two-way traffic; according to Marco Polo, the Muslims taught the Chinese how to refine sugar.) It has not yet been established to what extent industrial milling in Europe was influenced by Muslim practices. A likely area of transfer is the Iberian Peninsula, where the Christians took over, in working order, many Muslim installations, including the paper mills at Jativa. Windmills were probably known in Seistan (the western part of modern Afghanistan) before the advent of Islam. According to al-Mas’udi, a Persian claimed to the Caliph ‘Umar I that he was able to build a windmill. ‘Umar made him substantiate his claim by building one. Mills in Seistan are mentioned by the Arab geographers of the fourth/tenth century, but the first full description occurs in a book written about the year 669/1271. These were not the European type of windmill with a horizontal axle and a pair of gears. The mills were supported on substructures built for the purpose, or on the towers of castles or on the tops of hills. They consisted of an upper chamber in which the millstones were housed and a lower one for the rotor. The axle was vertical and it carried twelve or six arms covered with sails. The walls of the lower chamber were pierced with funnel-shaped ducts, with the narrower end towards the interior in order to increase the speed of the wind when it flowed on to the sails (Fig. 17). This type of windmill spread throughout Islam, and to China and India. In medieval Egypt it was used in the sugar-cane industry, but its main application was to corn-milling. The expression ‘fine technology’, applied to earlier times, embraces a whole range of devices and machines, with a multiplicity of purposes: water clocks, fountains, toys and automata and astronomical instruments. Some were designed to tell the time, as aids to scientific investigation and some to delight and amuse. What they have in common is the considerable degree of engineering skill required for their manufacture, and the use of delicate mechanisms and sensitive control systems. Many of the ideas employed in the construction of ingenious devices were useful in the later development of mechanical technology. When we look into the origins of fine technology, we inevitably find our attention directed to the Hellenistic world and, in particular, Alexandria. Thus we find that the first complex water clock and the first musical automaton are both attributed by Vitruvius to Ctesibius, an Egyptian engineer who worked in Alexandria about 250 B.C.E, and the first major treatise on ingenious devices was composed by Philon of Byzantium a contemporary of Ctesibius. Philon’s work was continued and extended by Heron of Alexandria, who flourished in the middle of the first century C.E. The origins of the astrolabe can be firmly placed in the school of Alexandria. It was almost certainly known to Ptolemy and was described by Theon of Alexandria (c. 350 C.E. ), whose writings are preserved in the treatise of Severus Sebokht, who composed his book in Kinnesrin in the north of Syria before 660 C.E. i.e. a few years after the Arab rule.. The tradition of fine technology continued uninterrupted and was further developed under Islam. Monumental water clocks in Syria continued to be installed in public places. The Abbasid Caliphs were interested in clocks and ingenious devices. The story of the clock that was presented by Harun al-Rashid (786-809), to Charlemagne in 807 C.E. is well known. It is reported also by Ibn Abi Usaybi’a that Al-Mutawakkil (d. 861) was so obsessed with ingenuous devices, literally Alat mutaharrika (moving machines), that he favoured the Bani Musa who took advantage of the Caliph’s obsession and persecuted their opponents.. The Banu Musa wrote their book on al-Hiyal during this period, and we infer from this story that they had actually constructed and operated their devices to please and satisfy the Caliph. In Kitab al-hayawan, al-Jahiz (776-867 C.E.) when discussing the measurement of time, says: ” Our kings and scientists use the astrolabe by day and the binkamat (clocks) by night” It is reported also by historians that Nasir al Dawla of Diyar Bakr (d. 1061 C.E.) had constructed a public binkm (clock) for the city of Mayyafariqin in the year 1012 C.E. When al-Jazari wrote his book 200 hundred years later in Diyar Bakr, he was describing a tradition that was firmly established in that area. Other clocks in public places were installed in some other cities of the Islamic east. The technology of clock-making was transferred to Muslim Spain and to Al-Maghrib. About the year 1050 C.E. al-Zarqali constructed a large water clock on the banks of the Tagus at Toledo in Spain. The clock was still in operation when the Christians occupied Toledo in 1085 C.E. A manuscript describing Andalusian monumental clocks was written in the eleventh century by Ibn Khalaf al-Muradi. Water clocks were constructed for public places in al-Maghrib. The remains of a public water clock in Fas can still be seen. In addition to water clocks and ingenious devices, the making of astrolabes and of geared astronomical mechanisms in Islam continued throughout the centuries as will be shown later. Our knowledge of Islamic fine technology will continue to improve with the publication of more research results. Model 26. A jar with an outlet pipe: during inpouring of a liquid the pourer can, according to choice, allow the liquid to discharge, or prevent its discharging. Model 43. A jar with a tap, into which three different liquids can be poured without mixing. When the tap is opened the liquids discharge in the sequence in which they were poured in. Model 77. A basin beside a closed reservoir. When moderate quantities of water are taken from the basin, like quantities run into it from a pipe at the bottom of the reservoir; if, however, a large quantity is taken no replenishment occurs. These effects, and many others, were produced by the ingenious combination of a number of hydraulic and mechanical components, two of which are shown in Figure 18. Figure 18(a) shows a double concentric siphon: pipe bd passes through plate f which divides the upper chamber from the lower, the joint being airtight. Pipe a-cc is placed over end b of pipe bd and held to it by soldering pieces of copper wire between the two pipes. End a of this pipe is closed. Another wide piece of pipe e-gg, its end e closed, is fixed over end d of pipe bd. The effect of introducing this device into a flow system is to create an airlock once the flow of liquid is interrupted, so that the flow cannot be restarted except under certain conditions. Onlookers could therefore be startled by unexpected events. The double concentric siphon does not occur in any of the Greek writings nor, as far as we know, in any Arabic work except the Banu Musas book. The fluid mechanics of its operation are surprisingly complex. The second mechanism is shown in Figure 18 (b). Seat b of a conical valve is soldered to the end of pipe a, and plug c of the valve is soldered to the end of a vertical rod, the other end of which is soldered to the top of float f. Above the float and integral with it is the small tank d which has a small hole e in the bottom of one of its sides. The float rests on the surface of the water in the slightly larger tank g. It works like this: water is poured in at a and runs through the valve into tank d; the weight of the liquid in tank d stops the valve-rod from rising and so the valve remains open. When pouring is stopped tank d empties into tank g through hole e, float f rises and the valve closes. No further inpouring can then take place. Conical valves do not appear in the works of Philon and Heron. They were made by casting the plug and seat together in a single mould, the material nearly always being bronze. Plug and seat were then ground together with emery powder to a watertight fit. A distinguishing feature of the Banu Musa’s work is therefore their confident use of conical valves as integral parts of flow systems. More generally, they show an astonishing empirical mastery of the use of small variations in hydrostatic and aerostatic pressures to produce a variety of effects. Although their work was well-known in the Muslim world for centuries after their time, none of their successors ever attempted to emulate them. They had, in fact, taken the subject to its limits with the materials and techniques then available, and nothing similar was done until the introduction of pneumatic instrumentation in modern times. A most important treatise was written in Muslim Spain in the fifth/eleventh century by al-Muradi. Unfortunately, the only known manuscript of the work is so badly defaced that it is impossible to deduce from it precisely how any of the machines was constructed. Most of the devices were water clocks, but the first five were large automata machines that incorporated several significant features. Each of them, for example, was driven by a full-size water wheel, a method that was employed in China at the same period to drive a very large monumental water clock. The automata were of the types that were common in water clocks, for example a set of doors in a row that open at successive intervals to reveal jackwork figures. The text mentions both segmental and epicyclic gears. (In segmental gears one of a pair of meshing gear-wheels has teeth on only part of its perimeter; the mechanism permits intermittent transmission of power). Although the illustrations are in other respects quite incomprehensible, they clearly show gear-trains incorporating both these types of gearing. This is extremely important: we have met simple gears in mills and water-raising machines, but this is the first known case of complex gears used to transmit high torque. It is also the earliest record we have of segmental and epicyclic gears. Sophisticated gears for transmitting high torque, first appeared in Europe in the astronomical clock completed by Giovanni de’ Dondi about 1365.C.E. Al-Jazari completed his magnificent book on machines in Diyar Bakr in the year 602/1206. This is the most remarkable engineering document to have come down to us, from any cultural area, until the Renaissance. In one respect it is unique: it was written at the wish of al-Jazari’s master, the Artuqid Sultan Nasir al-Din Mahmud ibn Muhammad, so that a record of the fragile devices could be available for succeeding generations of craftsmen, long after the devices themselves had perished. Each of the fifty chapters – text and illustrations – was therefore composed with detailed instructions for manufacture, so that the machines could be reconstructed by later craftsmen; Al-Jazari was successful in this aim because several of his devices including a monumental water clock, have been constructed by modern craftsmen working from al-Jazari’s instructions. The works of other writers, while they often describe the operation of the machines quite adequately, give only the sketchiest details of construction. Al-Jazari’s willingness and ability to communicate the knowledge gained by training, experience and informed experiment therefore endow his work with immense value. AI-Jazari was an engineer who took pride in continuing a long tradition of mechanical technology, and his work may in many respects be regarded as the epitome and the summit of the Islamic achievement in this field. With one or two notable exceptions, such as the complex gear-trains of al-Muradi, it is safe to assume that he dealt with most of the machines that had been known to his predecessors, while introducing innovations and improvements of his own. Indeed, he often acknowledges the work of earlier engineers, such as Archimedes or the Banu Musa in connection with a particular technique or type of machine, describes the earlier construction accurately and then tells us how he improved upon it. For instance, a certain type of flow regulator was used in water clocks by both Hellenistic and Muslim engineers. Al-Jazari found by experiment that it was inaccurate, and describes how he made an accurate instrument by carefully calibrating a small orifice to produce correct rates of flow under various heads of water. One example will have to suffice to give some idea of al-Jazari’s methods and the type of devices he constructed. This is the water machinery and some of the associated mechanisms from his third and fourth water clocks. These were driven by the submersible bowl or tahrajar a device that was normally used for timing the period of allocation of irrigation water to farmers. These two clocks are the only examples we have of the adaptation of the tahrajar for timekeeping, and it seems likely that this system was al-Jazari’s own invention. Figure 19 shows the basic principles; it would be impossible to describe either of the clocks fully, since they had a number of automata together with the mechanisms for activating them, some of them very ingenious. The bowl A with a calibrated orifice in its underside rests on the surface of the water in tank N, to which it is connected by the three flat pin-jointed links H. A rod is soldered across a diameter of the bowl, with hole K in its centre. At the top of the clock, supported on four columns, is the ‘castle’, a square brass box with a detachable dome. Inside the castle is a ball-release mechanism (not shown) from which a channel leads to the head F of a bird. The tail of the serpent, in effect a pulley, rotates on an axle that rests in bearings in transoms fixed between each pair of columns. The open mouth of the serpent is just below the head of the bird. A light chain D runs from the underside of the bowl to a staple in the tail of the serpent. A wire H is tied to hole K and to the ball-release. At the beginning of a time period – an hour or half an hour – the empty bowl is on the surface of the water. It sinks slowly until at the end of the period it suddenly submerges. Wire H operates the ball-release, and a ball runs into the bird’s mouth and out of its hinged beak into the mouth of the serpent. 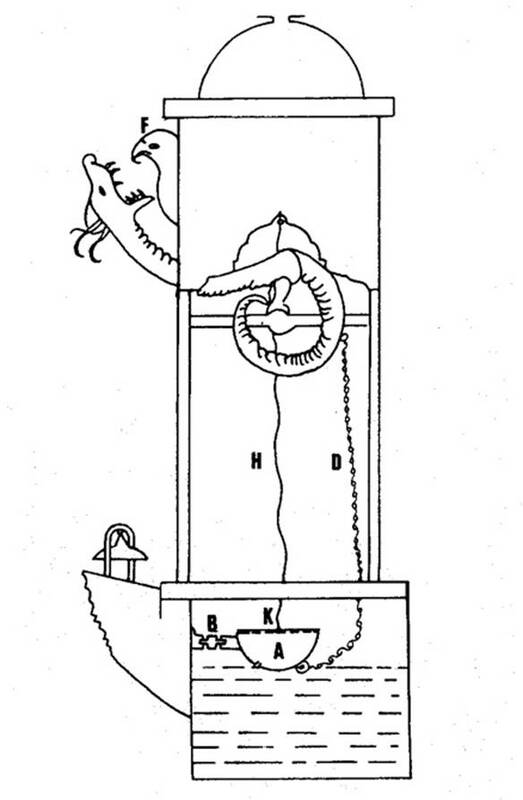 The serpent’s head sinks, and chain D lifts the bowl, which tilts due to the combined action of the chain and links B and discharges all its contents. The ball drops from the serpent’s mouth on to a cymbal, and the serpent’s head rises to its previous position. The empty bowl is again horizontal on the surface of the water, and the cycle re-starts. This is therefore a closed-loop system, since the clock will continue working as long as there are balls in the magazine. 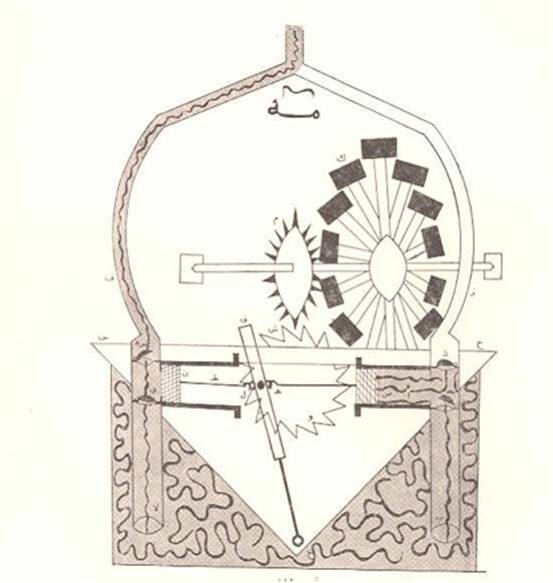 The concept of continuous operation occurs elsewhere in al-Jazari’s work; in his first clock, for example, the head of water over the orifice is kept constant by a hydraulic feed-back control system. 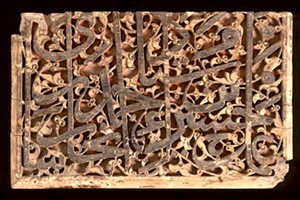 A number of ideas and techniques appear for the first time in al-Jazari’s work. These include the double-acting pump with suction pipes and the use of a crank in a machine (both already mentioned); accurate calibration of orifices; lamination of timber to minimize warping; static balancing of wheels; use of paper models to establish a design; and casting of metals in closed mould-boxes with green sand. There is also an indication that he knew of a method for controlling the speed of rotation of a wheel by an escapement of some kind. This is very significant when we consider a clock described in a Spanish work compiled in 1277 C.E. in which all the chapters are translations or paraphrases of earlier Arabic works. The clock consisted of a large drum made of walnut or jujube wood tightly assembled and sealed with wax or resin. The interior of the drum was divided into twelve compartments, with small holes between the compartments through which mercury flowed. Enough mercury was enclosed to fill just half the compartments. The drum was mounted on the same axle as a large wheel powered by a weight-drive wound around the wheel. Also on the axle was a pinion with six teeth that meshed with thirty-six oaken teeth on the rim of an astrolabic dial. The mercury drum and the pinion made a complete revolution in 4 hours and the astrolabic dial made a complete revolution in 24 hours. Clocks incorporating this principle are known to work satisfactorily, since many of them were made in Europe in the seventeenth and eighteenth centuries. This type of timepiece, however, with its effective mercury escapement, had been known in Islam since the fifth/eleventh century, at least 200 years before the first appearance of weight-driven clocks in the West. The astrolabe was the astronomical instrument par excellence of the Middle Ages; from its Hellenistic origins it was brought to perfection by Muslim scientists and craftsmen. Essentially it consists of a circular plate inside a raised annulus that is divided into degrees, the annulus being soldered to the rim of a base-plate. The first plate is engraved with the lines of azimuth and altitude for the latitude of the observer. Turning on a central pin above the plate is the rete or spider, made of open metalwork. This is essentially a star map, the principal fixed stars appearing as holes or gemstones; there is also a circle for the sun’s ecliptic. Rotating above the rete was an alidade. Both plate and rete were marked out by stereographic projection. The instrument was usually made of brass (see Figure 5). A number of astronomical problems, which otherwise have to be solved by tedious computation, can be solved very quickly by using the astrolabe. It has been established that the first European treatises on the astrolabe were of Arabic inspiration and were written in Latin at the beginning of the fifth/eleventh century in the abbey of Ripoll in Catalonia. From this centre the knowledge of the instrument was diffused to the rest of Europe. Other computing instruments were devised in the Muslim world in the later Middle Ages, perhaps the most important of these being equatoria, which were invented in Muslim Spain early in the fifth/eleventh century. The objective of the equatorium was the determination of the longitude of any one of the planets at a given time. This was done by constructing to scale and by mechanical and graphical means the Ptolemaic configuration for that particular planet at the given instant. As with the astrolabe, knowledge of equatoria was diffused into Europe from the Muslim world. The astronomical gearing mechanisms just mentioned were manually driven. But as mentioned above, al-Muradi’s machine, (Model 5), shows a system of gears for transmitting torque that is much more complex than any other power-driven gears known to have existed so early. 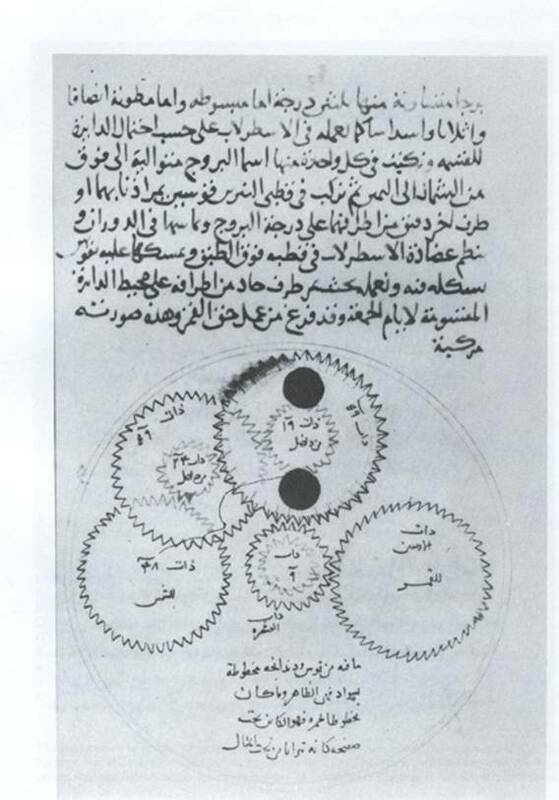 Many of the ideas that were to be embodied in the mechanical clock had been introduced centuries before its invention: complex gear trains, segmental gears in al‑Muradi and al‑Jazari, epicycle gears in al‑Muradi, celestial and biological simulations in the automata‑machines and water clocks of Hellenistic and Islamic engineers; weight‑drives in Islamic mercury clocks and. 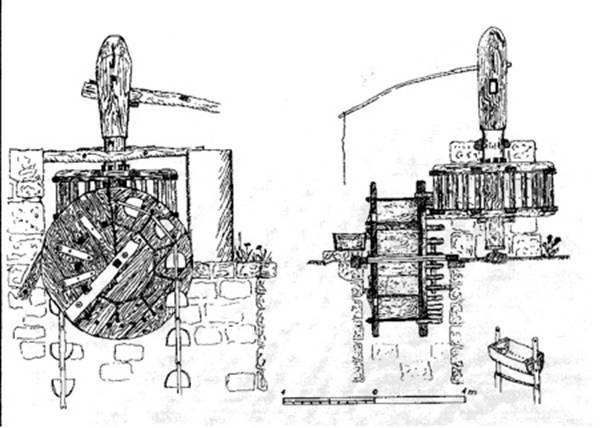 pumps, escapements in mercury docks, and other methods of controlling the speeds of water wheels. The heavy floats in water clocks may also be regarded as weights, with the constant‑head system as the escapement. We know that the Christians in Spain learned about Muslim water clocks, not only by the translation of Arabic works into Spanish but also by the inspection of actual clocks in Toledo. This knowledge was transferred to Europe and there was a substantial advance in the fifth/eleventh century in the techniques of hydraulic time-keeping. In a treatise written by Robertus Anglicus in 1271, it is mentioned that the clockmakers – i.e. the makers of water clocks – were trying to solve the problem of the mechanical escapement and had almost reached their objective. The first effective escapement appeared a few years later. This evidence, circumstantial though it is, points strongly to an Islamic influence upon the invention of the mechanical clock. In the middle of the sixteenth century, mechanical clocks from Germany and other European countries reached the Ottoman Empire. Taqi al-Din wrote in 1556 C.E. his book Al-Kawakib al-Durriyya fi al-binkamat al-Dawriyya (The Brightest Stars for the Construction of Mechanical Clocks) in which he described a clock incorporating some of his inventions. He refers to the pocket watch (that uses a spring) from which we infer that they were quite common. Banu Musa, Kitab al‑hiyal, critical edition of the Arabic text by Ahmad.Y. al-Hassan, Aleppo, 1981, Institute for the History of Arabic Science. English translation by Donald R. Hill, The Banu (sons of) Musa ibn Shakir, .The Book of Ingenious Devices. (Kitab al-hiyal), Dordrecht/Boston/London, 1979, Reidel Publishing Company. Glick, T.F. : Irrigation and Society in Medieval Valencia, Cambridge, Mass., 1970, Harvard University Press. Goblot, Henry: Les Qanats, Mouton. Paris,1979. al-Hassan, Ahmad Y.: Taqi al-Din and Arabic Mechanical Engineering, (in Arabic), Aleppo, 1976, University of Aleppo Press. al-Hassan, Ahmad Y.and Donald R. Hill: Islamic Technology, An illustrated history, CUP and UNESCO, 1986. (1981): Arabic Water‑clocks, Aleppo, 1981, Institute for the History of Arabic Science, University of Aleppo. (1984): A History of Engineering in Classical and Medieval Times, London, 1984, Croom Helm. (1993): Islamic Science and Engineering, Edinburgh, 1993.
al-Jazari (1): A Compendium on the Theory and Practice of the Mechanical Arts, Arabic text edited by. Ahmad.Y. al-Hassan, Aleppo, 1979, Institute for the History of Arabic Science, University of Aleppo. al-Jazari: (2): The Book of Knowledge of Ingenious Mechanical Devices, Annotated English translation by Donald R. Hill, Dordrecht/Boston, 1974, Reidel Publishing Company. (1900): Baghdad during the Abbassid Caliphate, Oxford, 1900. (1966): Lands of the Eastern Caliphate, London, 1905, Frank Cass ; 2nd edition,. 1966. Needham, J.: Science and Civilisation in China, 5 vol. Cambridge, 1954-, Cambridge University Press. 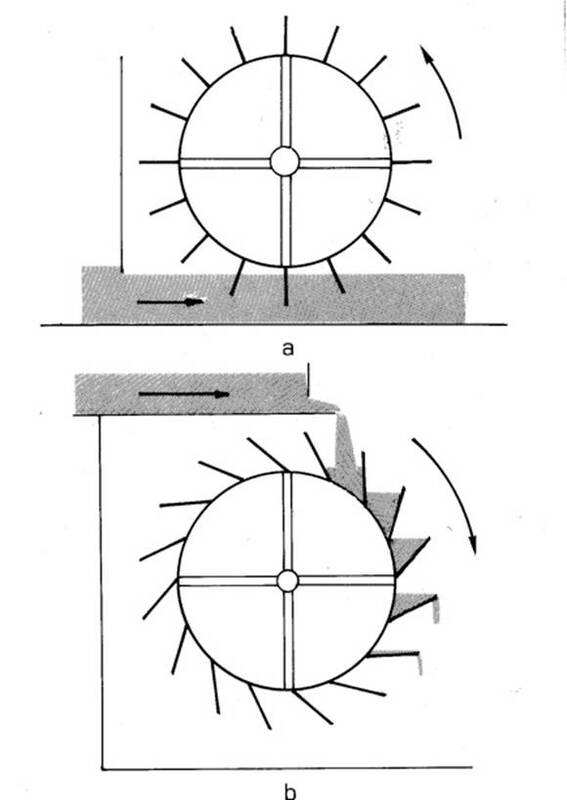 Schioler, T.: Roman and Islamic Waterlifting Wheels, Odense, 1973, Odense University Press. Singer, C. ‑ Holmyard, E.J. ‑ Hall, A.R. ‑ Williams, T.I. (ed. ): A History of Technology, 7 vol., Oxford, 1956, Oxford University Press; reprinted. 1979. Smith, N.A.F. (1971): A History of Dams, London, 1971, Peter Davies. (1975): Man and Water, London, 1975, Peter Davies. (1970): Aufsätze zur arabischen Wissenschaftsgeschichte, 2 vol., Hildesheim/New York, 1970, coll. "Collectanea, VI", Olms. Wulff, H.E. : The Traditional Crafts of Persia, Cambridge, Mass., 1966, MIT Press ; reprinted 1976. This paper was originally written by the late Donald R. Hill in Histoire des sciences arabes, vol. 3, ed. Roshdi Rashed, Paris, 1997. It was edited and expanded by Ahmad Y. al-Hassan for publication under Hill and al-Hassan, “Ingeneria”. Storia Della Scienza, Vol. Ill, Capitolo LI. Enciclopedia Italiana, 2002, 647-666. This online text is the third edited version. Glick Thomas, Irrigation and Society in Medieval Valencia pp. 169-170,186,214,230,264-265. Hill, D.R., Islamic Science and Engineering, p.178. The Banu Musa sometimes took contacts from the Caliph for irrigation works and subcontracted them. See Hill, D.R., The Book of Ingenious Devices, p. 5, and Ibn Abi Usaybi’a , ‘Uyun al-anba’, Beirut, ed.Nizar Rida, p. 286. Hill. 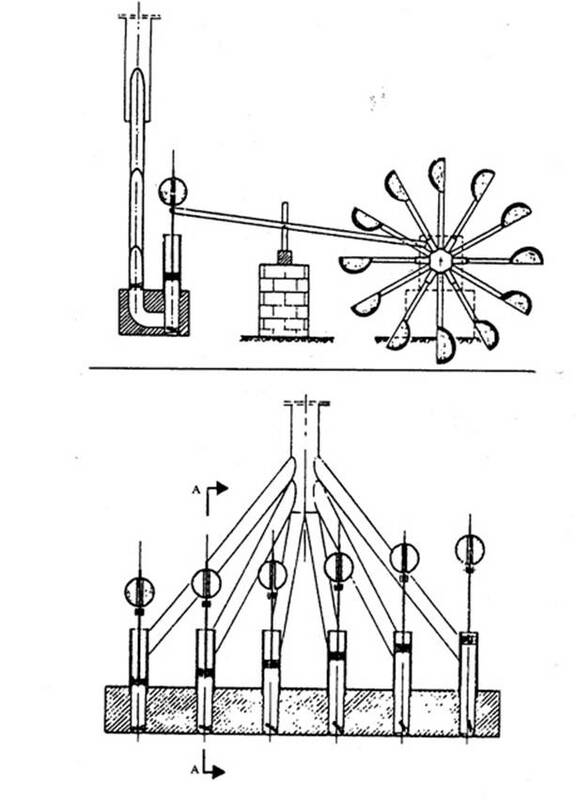 Islamic Science and Engineering, p. 187; Cahen, Claude, 'Le Service de l'irrigation en Iraq au debut du XII siecle', Bulletin d'études orientales, Vol. 13, 1949‑51, 117‑43. Al-Karaji, Inbat al-miyah al-khafiyya, Hyderabad, 1945. Al-Muqaddasi, Ahsan al-taqasim fi ma’rifat al-aqalim, ed. De Goeje, Brill, 1906, p. 444. Jabir ibn Hayyan, Kitab al-sab’in, published in facsimile by Fuat Sezgin, Frankfurt, 1986, pp. 124-125. Einhard and Norken the Stammerer, Two Lives of Charlemagne, Translated by Lewis Thorpe, Hammondsworth, 1979, p. 50-51. See also Hill, Studies in Medieval Islamic Technology, article V, p. 179. 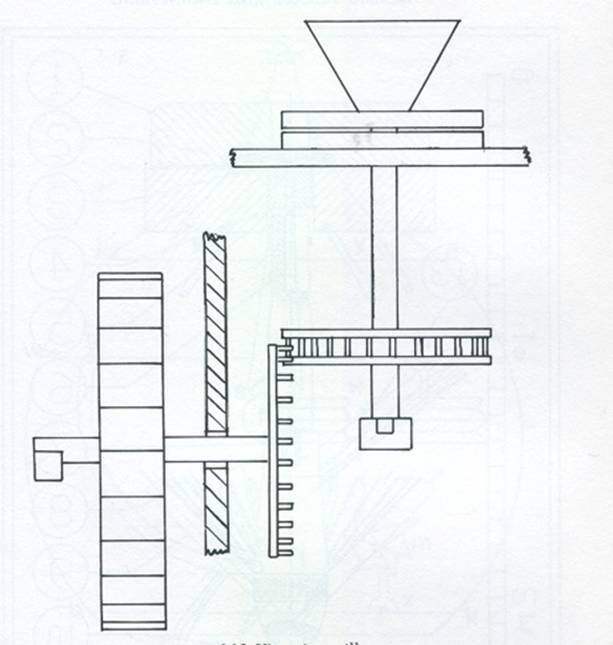 Price, Derek de Solla, “Mechanical Water Clocks of the 14th Century in Fez, Morocco”, Proceedinggs of the Xth International Congress of the History of Science, Ithaca, N.Y. and Philadelphia, 1962. Ibn Battuta, Rihlat Ibn Battuta, Beirut, 1964, p.92. Tekeli, Sevim, The Clocks in Ottoman Empire in 16th Century, And Taqi al-Din’s “ The Brightest Stars For The Construction Of The Mechanical Clocks”, Ankara University, 1966. This book contains the Arabic text of Taqi al-Din’s Al-Kawakib al-durriyya fi al-binkamat al-dawriyya, and its translation into Turkish and English. See the English text p.144, and the Arabic text p. 221. Al-Hassan, Taqi al-Din and Arabic Mechanical Engineering. See selected bibliography at the end of this article. Hill, Studies in Medieval Islamic Technology, article XIV, on “Al- Biruni’s Mechanical Calendar”. Price, Derek de Solla, in his paper on the Antikythera Mechanism , Scientific American, June 1959, pp. 60-67. Hill, Arabic Water clocks, p.43. Tekeli, op cit, pp .245, 277 (Arabic text), pp.159, 182 (English text).